Composition avec bleu, rouge, jaune et noir (1922) by Piet Mondrian, part of the Yves Saint Laurent – Pierre Berge collection; sold for €21.6 million, beating its estimate range of €7 million to €10 million and setting an at-auction record for the artist. Image via Christie’s. Following three days of viewing by the public in the majestic setting of the Grand Palais in Paris, Christie’s kicked off its marathon three day, six session auction of the vast Yves Saint Laurent and Pierre Berger collection–700 pieces collected over five decades. A moribund art market and legal manoeuvrings by the Chinese government were not enough to put a dent on the first day of auctions, as Christie’s realized $264 million including commissions, setting a record for the sale of a personal collection, beating out a 1997 auction of Victor and Sally Ganz’ extensive private collection which sold for $206.5 million. This first auction focused on Impressionist and modern art, with 61 lots on sale. While Picasso’s Instruments de musique sur un gueridon, a synthetic cubist piece from 1912 estimated at €25 million to €30 million, failed to sell, records were broken for Matisse, Brancusi and Mondrian. Other high priced lots by blue chip names sold very well to a field of over 1,200 participants, with another 100 partaking in the sale via phone. The Grand Palais served as a giant showroom, conceived as a recreation of sorts of St Laurent’s and Berge’s apartment in Paris’ 7th arrondissement. Over 30,000 thousand people are expected to visit the Palais during the course of the public exhibition and the auction. Les Coucous, tapis bleu et rose (1911) by Henri Matisse, part of the Yves Saint Laurent – Pierre Berge collection; sold for €35.1 million against an estimate range of €12 million to €18 million and setting an at-auction record for the artist. Image via Christie’s. Les coucous, tapis bleu et rose, a Matisse still-life dating from 1911, sold for €35.1 million, a formidable sum in today’s dismal art market. The painting of cowslips in a vase handily surpassed its estimate range of €12 million to €18 million. 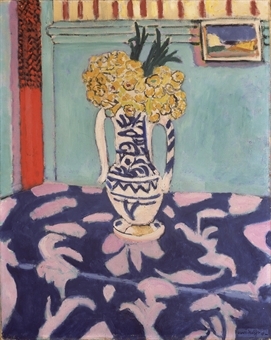 This is the highest price ever paid for a Matisse at an auction, and the piece belongs to an important series of paintings incorporating still life subjects with bold colors and textiles, whether present aesthetically or in the composition’s actual material. Madame L.R. (1914) a sculpture by Constantin Brancusi, part of the Yves Saint Laurent – Pierre Berge collection; sold for €29.2 million against an estimate range of €15 million to €20 millionand setting an at-auction record for the artist. Image via Bloomberg. 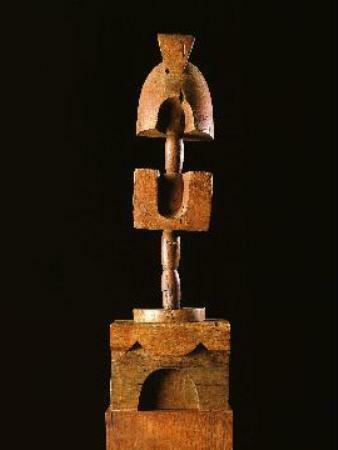 Madame L.R., a wooden modernist sculpture by Romanian artist Constantin Brancusi, sold for €29.2 million. The L and R refer to Leonie Ricou, a Parisian art enthusiast and patroness, and the sculpture is heavily influenced by the African aesthetic that informed the work of many of Brancusi’s contemporaries. 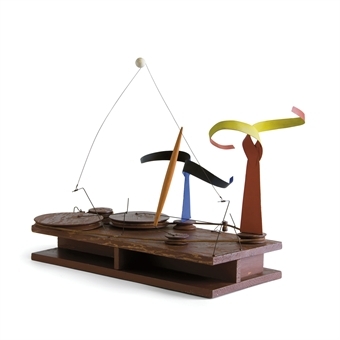 The sculpture was originally owned by Fernand Leger, and was acquired by Berge and St Laurent in the late 1950s as they began their career as collectors in earnest. 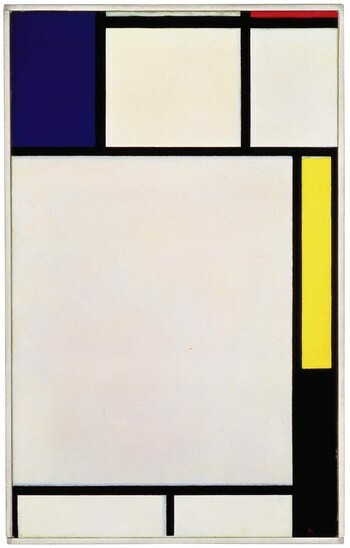 An abstract painting by Piet Mondrian, Composition avec bleu, rouge, jaune et noir, also broke a record for that artist when it sold for €21.6 million, beating its estimate range of €7 million to €10 million. It was one of three Mondrians offered in the sale, and ultimately went to Giovanna Bertazzoni, head of Christie’s Impressionist and Modern department. Piet Mondrian was a significant aesthetic influence on Yves St Laurent’s work, and was the basis for his Fall 1965 collection, one of his most famous and influential. 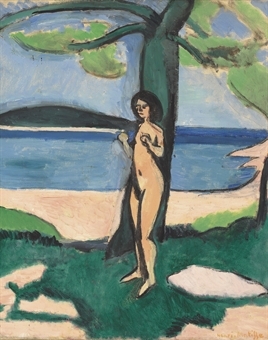 Nu au bord de la mer (1908) by Henri Matisse, part of the Yves St Laurent – Pierre Berge collection; sold for €8.2 million against a range of €4 million to €6 million. 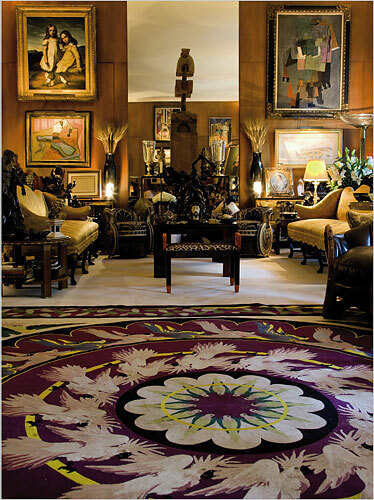 Image via Christie’s. Dancers and Sphere (1986) by Alexander Calder, part of the Yves St Laurent – Pierre Berge collection; sold for €1.5 million against a range of €1 million to €2 million. Image via Christie’s. 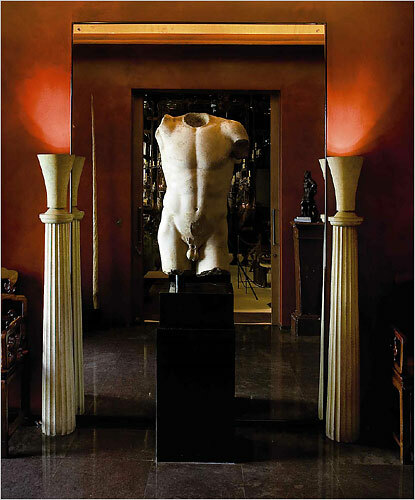 Roman Athlete’s Torso, part of the Yves St Laurent – Pierre Berge collection. Image via the New York Times. A number of other artists’ auction record prices were also broken. Belle Haleine – Eau de voilette by Marcel Duchamp set a new record for the artist when it sold for €8.9 million, multiples of its €1 million to €1.5 million estimate. James Ensor’s Le desespoir de Pierrot set a record at €4.9 million, well above its high end estimate of €3 million. A new auction record was also set for Giorgio de Chirico, with Il Ritornante raking in €11 million against estimates of €7 million to €10 million. Lastly among the recordbreakers at the auction, Paul Klee’s Gartenfigur fetched €3.9 million, just over four times its high estimate of €900,000 euros. 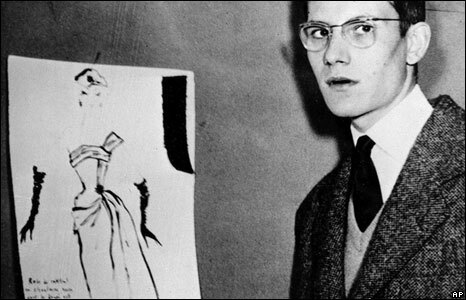 A teenaged Yves St Laurent next to a sketch of the cocktail dress that first brought him recognition, in 1954. Image via the BBC. Yves Saint Laurent at his final show in 2002, on stage with Catherine Deneuve, Katoucha, and other fashion luminaries. Image via the BBC. While Fernand Leger’s La tasse de the did not break any records, the painting sold for €11.5 million, pricing within estimates of €10 million to €15 million. Another Matisse, Nu au bord de la mer, garnered €8.2 million against a range of €4 million to €6 million. While one would think that Berge would be sad to part with such a large collection filled with marquee names, he remarked that the collection lost its meaning once St Laurent passed away. The auction will benefit the Fondation Yves St Laurent – Pierre Berge, which will give the money to cultural and AIDS-related charities. 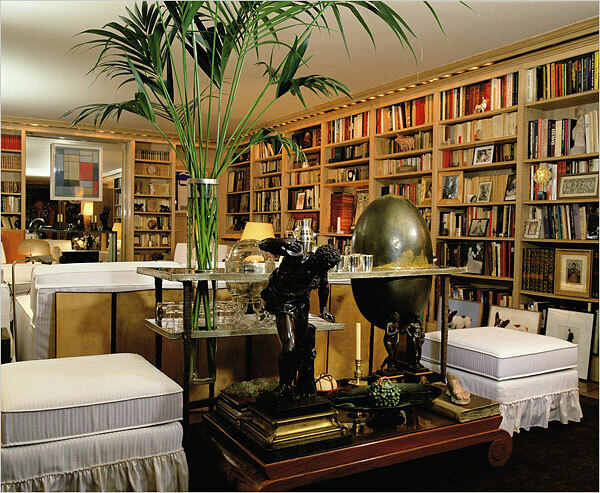 View of the Library at Yves St Laurent’s apartment at Rue de Babylone, 7th arrondissement, Paris. Image via the New York Times. 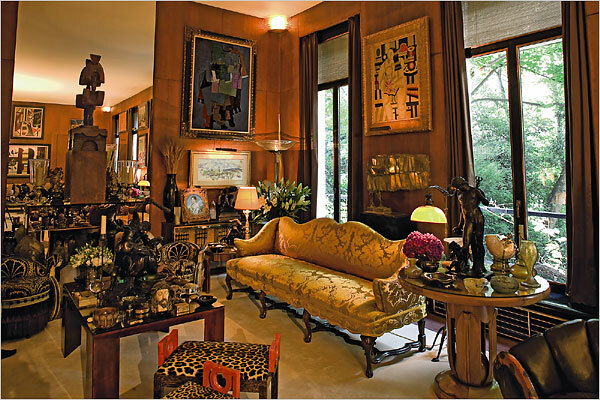 View of the Music Room at Yves St Laurent’s apartment at Rue de Babylone, 7th arrondissement, Paris. Image via the New York Times. 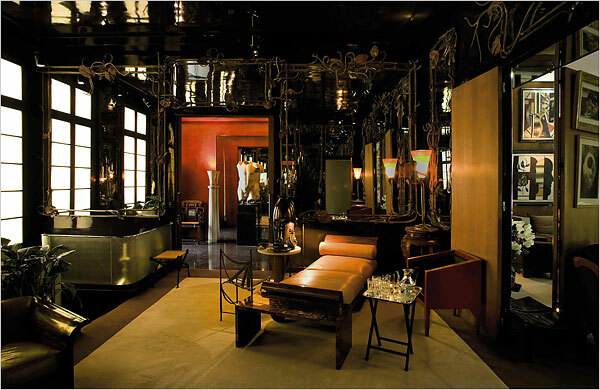 View of Yves St Laurent’s apartment at Rue de Babylone, 7th arrondissement, Paris. Image via the New York Times. This entry was posted on Tuesday, February 24th, 2009 at 6:10 pm	and is filed under Art News. You can follow any responses to this entry through the RSS 2.0 feed. You can leave a response, or trackback from your own site. Fabulous pictures. Thank you for letting me in! Cheers. We were trying to find exactly like the info.